The Japanese Earthquake is still creating headlines around the world, but finally some good news. 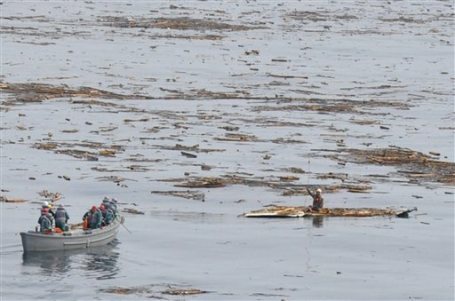 A Japanese man who was swept 15km out to see by the deadly tsunami was plucked to safety yesterday after being spotted clinging to a piece of wreckage. The 60 year old man was discovered floating on a piece of roof in waters off Fukushima Prefecture, two days after the disaster struck. The man is from the city of Minamisoma which has been virtually obliterated by the tsunami and was swept out along with his house after the massive tsunami struck. He is in good condition and was taken to hospital by helicopter. Hopefully more & more good news received. This was one piece of good news after all the devastation of the disaster. Hopefully more to come in the next few days. Let's hope for more positive news like this to come out. Thank you for this positive post. Apart from the horrific situation in Japan, I really like your blog! Thanks Lina, I hope there is a lot more positive news to come. Thanks Daphne, I enjoyed looking at your blog and reading about your experiences in Asia. i think news like this is always uplifting in the midst of such tragedy. thank u for sharing! i hope everyone donates to the red cross! Thanks Amuseinme, it is great to hear some uplifting news for a change and hopefully people are getting behind organisations like the Red Cross and helping out.